A glacier is a thick mass of ice that covers a large area of land. Around ten percent of the world's land area is covered by glaciers. Most glaciers are located near the North or South Poles, but glaciers also exist high in mountain ranges such as the Himalayas and the Andes. Glaciers form from snow that doesn't melt even during the summer. When enough snow builds up the weight of the snow will compress and turn into solid ice. It can take hundreds of years for a large glacier to form. Although glaciers are made of ice and appear to be sitting still, they are actually moving. The weight of a glacier will cause it to move slowly downhill, sort of like a very slow moving river. The speed of glaciers varies widely with some moving as slow as a few feet a year while others may move several feet per day. Calving - A calving glacier is one that ends in a body of water like a lake or an ocean. The term calving comes from icebergs that break off the glacier or "calve" into the water. If the body of water has tides (like the ocean), the glacier may also be called a tidewater glacier. Cirque - Cirque glaciers form on the slopes of mountains. They are also called alpine or mountain glaciers. Hanging - Hanging glaciers form on the side of a mountain above a glacial valley. They are called hanging because they do not reach the valley where the main glacier is located. Ice cap - An ice cap is formed when ice completely covers an area of land such that no part of the land, not even mountain peaks, poke through the top of the ice cap. Ice field - An ice field is when ice completely covers a flat area. Piedmont - A piedmont glacier is formed when a glacier flows into a plain at the edge of a mountain range. Polar - A polar glacier is one that is formed in an area where the temperature is always below the freezing point. Temperate - A temperate glacier is one that coexists with liquid water. Valley - A valley glacier is one that fills a valley between two mountains. Ablation zone - The ablation zone is the area below the accumulation zone where the glacial ice exists. In this area there is a loss in ice mass due to ablation such as melting and evaporation. Accumulation zone - This is the area of the glacier where snow falls and accumulates. It is located above the ablation zone. It is separated from the ablation zone by the equilibrium line. Crevasses - Crevasses are giant cracks that occur on the surface of glaciers typically where the glacier flows the fastest. Firn - Firn is a type of compacted snow that lies between the new snow and the glacial ice. Head - The glacier head is where the glacier starts. Terminus - The terminus is the end of the glacier. It is also called the glacier foot. When glaciers move they can change the land creating many interesting geological features. Here are some of the geological features that are created by glaciers. Arete - An arete is a steep ridge formed by two glaciers that erode on opposite sides of a ridge. Cirque - A cirque is a bowl-shaped landform in the side of a mountain made by the head of a glacier. Drumlin - A drumlin is a long oval-shaped hill created by glacial ice movement. Fjord - A fjord is a U-shaped valley between steep cliffs created by glaciers. 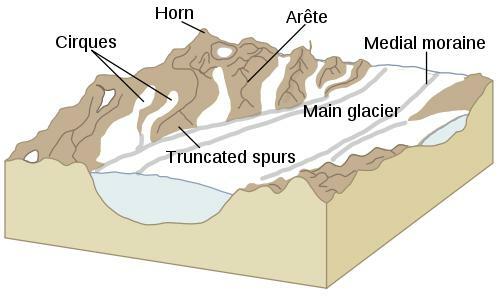 Horn - A horn is a pointy-shaped mountain peak created when many glaciers erode the same mountain top. Moraine - A moraine is an accumulation of material (called till) left behind by a glacier. Examples include rocks, sand, gravel, and clay. Tarn - Tarns are lakes that fill up cirques once the glacier has melted. Most of the country of Greenland is covered with a giant icecap that is nearly two miles thick in areas. Because of friction, the top of a glacier moves faster than the bottom. A retreating glacier doesn't actually travel backward, but is melting faster than it is gaining new ice. Sometimes glaciers will move much faster than normal. This is called a glacial "surge." At over 125 miles long, Bering Glacier in Alaska is the longest glacier in the United States. A scientist who studies glaciers is called a glaciologist.